Blumenthal’s affection for Bill and Hillary Clinton reaches all the way back to 1970, when he and the Clintons began their political romance at Yale. 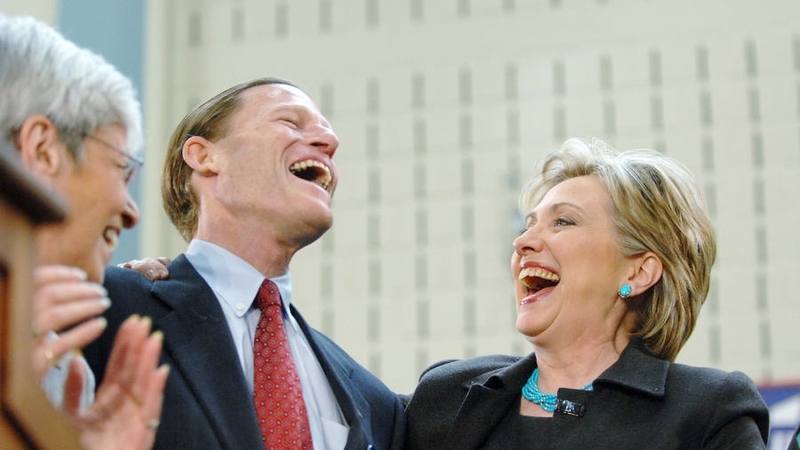 Blumenthal was a “strong supporter and surrogate for Hillary Clinton” when she ran for president in 2016, according to a report in CTMirror. Blumenthal said of Hillary that she was “very smart, serious and studious… I don’t think anyone thought she would become president. A Supreme Court justice or cabinet member seemed more likely.” Blumenthal was not alone in supposing that Hillary, the Lucretia Borgia of Democrat mainstream politics, would easily polish off Trump in the general election. Alas, the best laid plans of mice and men are often torn asunder. Following the closure of the Mueller investigation, reasonable people may conclude that Clinton’s presidential ambitions were not torn asunder by a Trump-Putin collusion. This is not to say that Putin and his operatives did not seek to “undermine faith in the U.S. election,” a pastime of Russian communists since the days of Joseph Stalin, who found a useful idiot in Henry Wallace, Franklin Roosevelt’s former Vice President, then the leader of the Progressive Party. Wallace delighted Stalin when he argued in 1948 that “The bi-partisan Marshall Plan, under the guise of a ‘recovery’ program is actually the first step toward the formation of a Western military bloc aimed at Russia.” Truman’s Marshall Plan was designed to assist nations defeated in the war to recover from the battering. Stalin and Soviet Union facilitators, here in the United States and elsewhere, had plans to gobble up stricken nations and pull them into the post war Soviet orbit. No opposition researcher within the Republican Party has yet accused Blumenthal of being a Putin stooge, but continuing Democrat Party opposition to a fairly won election has surely done more than Putin or his operatives to undermine the faith of Americans in their election process. The operative principle of the “never Trump” gang appears to be that highly speculative narratives may be, like some convincing fictions, more truthful than the truth. If the Democratic house, Lincoln’s house divided, must be burned to the ground to rout a rat and recover the US Senate and the presidential office, so be it. It is the shame of the nation that premier media institutions have agreed to reinforce a largely false Democrat narrative. Perhaps the most damaging assertion to the never-Trumpers in the Mueller report is that Mueller, after a painstaking two year investigation, FOUND NO EVIDENCE of Trump/Russia collusion. This assertion puts a damper on the notion, now being peddled by the coupists and large-throated media outlets, that Mueller failed to indict Trump because he knew that presidents cannot be prosecuted while in office – when, in fact, Mueller found there was no “there” there. It is very doubtful that Blumenthal, an accomplished tale spinner and opo-research merchant, will find the nonexistent evidence of collusion by scrutinizing the Mueller report. It must be concocted and then spoon-fed to morning Joe Scarborough and Mika Brzezinski. Actually, the US Attorney General is barred from releasing to Blumenthal grand jury testimony taken from innocent witnesses who have not been cited for crimes. Saint Blumenthal did not release such information when he was Attorney General of Connecticut pulling the wings off some business butterfly that had been reported to his office by Connecticut’s Consumer Protection Department. His challenge to Barr is an invitation to prison. And, in any case, the artful dodger has moved on to a more fertile field – Trump’s taxes. Conspiracy and collusion were useful foils while they lasted. Time to move on.